During May, 1911, Dexter P. Dorgan of the Continental Aviation Company, San Francisco, arrived in Honolulu to arrange flight demonstrations by pilots Clarence H. Walker and Didier Masson. A young millionaire, Walker originally took up flying as a pastime. He built his own airplane at Salt Lake City but, unable to make it fly, decided to take bona fide flying lessons then buy an airplane of standard construction. Masson was an experienced pilot with a reputation for daring. Most noteworthy of his recent aerial feats was participation in the United States’ first aero meet, in Los Angeles, the previous year. He had amazed onlookers there by climbing to a height of 6,000 feet and carrying 500 newspapers over a “sensational 79-mile route,” then delivering the papers upon flight completion. Arizona and Mexico were the sites of his most recent demonstrations. His airplane was a Bleriot Antoinette with a Gnome seven cylinder engine developing 50 hp. Walker and Masson arrived in Honolulu on June 3. The former’s biplane was on board, so was the new Mrs. Walker. Four days later, Walker, his wife and Mr. N. C. Adossides, president of the Continental Aviation Company, were in Hilo, Hawaii. They met with the local promoter, Mr. Felix Brughelli, and made arrangements for flight demonstrations out of Honolulu Park, a horseracing facility in Hilo. Walter inspected the track to check for flight suitability. He found the enclosure too small for easy take-offs but indicated a willingness to make a flight from the grounds if a purse of $500 was offered. Two days were agreed upon, Saturday, June 10 and the following day. The Hilo Railway set up a special schedule for the two days to handle the expected large crowds. Brughelli began selling subscriptions and found eager response from Hilo residents. On Saturday, Walker and his group arrived at Honolulu. 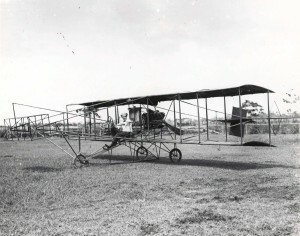 The flyer made several test flights prior to public demonstrations, thus giving Big Islanders their first view of an airplane in action. The paying crowd which had gathered was disappointingly small; most of the local people were planning on Sunday for the aerial show. The aviator got ready. Mrs. Walker stood by proudly as her husband started the engine and bumped along the grassy field to a quick take-off. The biplane rose rapidly amidst enthusiastic cheers. “From the beginning the eight cylinder engine was heard to misfire, the plane’s wings tipping from side to side. He flew to the edge of the ocean about two miles from the field then decided that a quick landing was the next order of activity. Walker said later, “I thought of landing in the ocean and then on the beach, but the water looked too deep and the beach was too full of boulders.” The flyer headed back to the field with his unsteady, coughing airplane. Then on the eave of a smooth landing, a gust of wind caught and dashed the airplane into a 25-foot high lauhala tree. Four or five of the boys perched atop the tall tree were knocked to the ground. The tall tree’s outstretched branches served to soften the plane’s fall and the craft impacted the ground in sections. The spunky pilot emerged from the wreckage and climbed onto the race track fence to show crowds, including his wife, that he was unhurt. This dramatic gesture was marred somewhat when fence boards gave way, sending Walker reeling unceremoniously to the ground. The atmosphere further lightened when Walker unleashed a verbal tirade about the airplane manufacturers and bemoaned his loss of $6,500. Repairs to his wrecked biplane were arranged with Hilo mechanics and the young couple boarded an interisland ship for Honolulu to join Masson and the others. The Hawaii Herald’s June 15 edition carried the aviation story on its front page. It stated that spectators got their money’s worth, seeing the airplane fly “but also had a chance to realize the danger of the sport, when Aviator Walker’s biplane came to a sudden stop in the branches of a lauhala tree.” Walker received $1,250, the contracted fee, and the promoter lost approximately $1,000 due to one day’s demonstrations having to be cancelled. Walker found Dorgan departing for Australia to make arrangements for flight demonstrations in several major cities. E. J. Love was left in charge of local activities. Masson’s two monoplanes had arrived on the SIERRA, June 16. Kapiolani Park was suggested by Walker as the flying site in Honolulu. The park had broad fields and numerous roads to admit large numbers of spectators and comparatively steady winds blew across it. The demonstrations were to be public events. Admission could not be charged, yet the flyers required a guaranteed fee of $1,500. For that amount, 10 flights would be made by the duo using both types of airplanes, biplane and monoplane. They promised “sensational stunts” and considered the price a bargain as compared to Bud Mars’ offer. In addition, Masson promised to make a “20-mile flight in unknown airs from Leilehua to Kapiolani Park at 5,000 feet altitude,” for the benefit of interested Army officers from Schofield Barracks. The date for both performances was set at June 18. Crowds came early the morning of June 18 and camped at Kapiolani Park until demonstration time. Soon there were 10,000 people on site. At 6:11 a.m., the veteran French pilot took off from Leilehua, circled the Barracks, and then flew at the promised altitude toward Diamond Head. En route, he encountered a cloudbank which set his engine to misfiring. The worried Masson made a safe landing at Kapiolani Park 19 minutes later. The ADVERTISER, some months later, announced that Masson became a mercenary flyer for Revolutionist Pancho Villa and dropped the first known bomb from an airplane in the Western Hemisphere (May 10, 1913). He had smuggled two biplanes across the Mexican border into the state of Sonora where he joined Revolutionists besieging the city and port of Guaymas. He flew regularly over the defenders’ lines, averaging four flights a week. For this he reportedly received a salary of $800 per month. The article stated that on one reconnaissance flight, Masson’s plane became unmanageable and was forced to land, where upon the flyer was captured by Mexican Federals. It was stated that a rope was placed around his neck, his hands bound, and then Masson was led to the edge of a freshly-dug grave where a squad of soldiers shot him. Didier Masson, however, remained very much alive and went on to military aviation fame during the Great War. Along with Raoul Lufbery and a number of other flyers, Masson joined the exciting Lafayette Escadrille (and remained with the French Air Service when the American Air Service absorbed this unit).